Driving the Boat in High Winds - Safety First! Keep the Bow Raised! Trim your motor down (to help keep the bow up). Hold on, sit with back against seat for support for rough hits. “Slumping over” does not give your back support. If you are the passenger, plant your feet firmly in front of you on the lower part of the console to help absorb the shock of hitting hard. If your engine stops, drop an anchor from the bow to combat drifting and swamping. Never drop anchor from the stern. If your course dictates that you are running in the direction of the trough of waves (parallel to them) you must take extra caution. As your boat bounces up and down from trough to trough it may roll excessively and possibly dangerously. 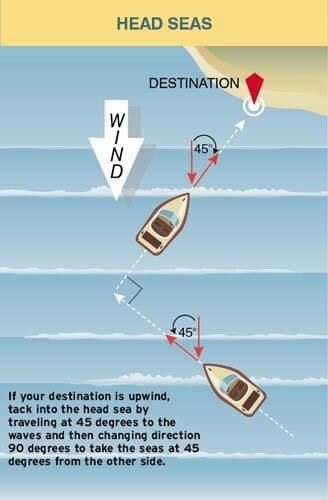 In these conditions in a powerboat, it is best to change course and make a series of tacks, taking the wind and waves at a 45° angle, first broad on your bow and then broad on your quarter. This zig-zag course should leave your boat in the trough for only long enough to turn. You want to minimize the time that you are in the trough and broad side to the swell to prevent broaching. 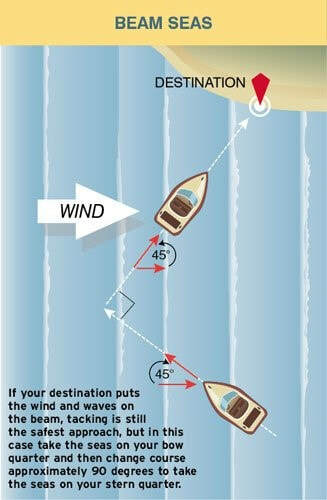 If driving directly into the wind, the boat will be going up and over each wave and then declining into the trough. This is when speed is crucial. Remember to adjust the speed of the boat so it gently goes over the top of each crest. As the boat descends into the trough, reduce the speed and keep the bow of the boat raised so that it will not be buried into the upcoming wave. Maintain a hand or foot on the throttle at all times and adjust the boat’s speed to each wave. As the waves grow bigger and steeper, quartering the waves might be a better option. By steering the boat so that it meets the waves at an angle rather than perpendicular, the rough motions will be avoided. In the instances where you are traveling in the same direction as the waves, maintain enough speed to stay ahead of the crests. Waves often come in sets so use that to your advantage when preparing to enter and exit rough waters. In any direction, make sure to study the waves, check the balance of your boat and keep the bow up. Trolling motor not locked down, hit wave, trolling motor bounced out, got pulled into water. Drew several rods into the water with it… Lock your trolling motor down! Fishing in a protected cove and all is calm. Saw a change in the sky over the island… By the time boater decided to go in, the swells were dangerously huge! Remember, sometimes the storm is not in your view. Spearing a wave and filling the boat with water. Keep your bow up and go slow if conditions warrant it. Passenger suffered back damage. Think of your back, especially if you are the passenger. Think of back support. Sit upright with your back to your seat and hold on. It is the boater’s responsibility to handle the boat safely. Tournaments will blast off knowing upcoming weather conditions are subject to change.